In case you’ve been wondering when the Valley Bar is going to be rebuilt, the answer is not looking good. And it turns out that it’s not money problems holding up the rebuild, or issues with the insurance company; it’s actually zoning problems that are preventing the owners from rebuilding. It turns out that the tiny little parcel at the corner of Centerville and Hwy 88 has been zoned for agricultural use in the county’s Master Plan. How something like that happened when there was a bar sitting on the land, and had been since the turn of the last century, is a mystery of county administration. So when the owner, Julian Larrouy, wanted to rebuild the burnt bar, he ran afoul of the zoning, which said that land could only be used for agricultural purposes. Never mind that the land is barely big enough to plant a vegetable garden; you don’t go against the Master Plan. So, Larrouy had to arrange for a special meeting of the Douglas County Planning Commission this week to amend the Master Plan and get the zoning changed on that land so he could get to work bringing the bar back. In an article from Sunday’s Record Courier, he seemed confident that the county would see the inanity of the situation and change the zoning. He was wrong. The Planning Commission denied it, even though half the valley turned out in support of it. There were 4 votes in favor, but a matter like this needs five. It sounds like the next step is to take the matter to the county commissioners in December, and try to get approval from them. So they don’t have any problems changing zoning to allow hundreds of houses to be built all over the valley, but they can’t let this slip through? I think I see a lawsuit coming on. This doesn’t make sense. 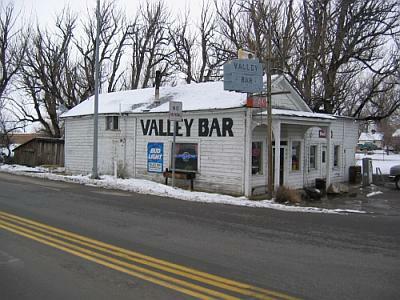 The Valley bar is history, they canot just deny it. Especially when, as you say, they are okay slapping houses up everywhere but heaven forbid they allow a tiny bit of Nevada history to be re-built.